The following three crystal fountains were designed exclusively for the Feng Shui Store by a local artist and craftsman. This not only adds to the value, it gives you a rare opportunity to own a piece of crystal art that you will never see the same anywhere in the world. 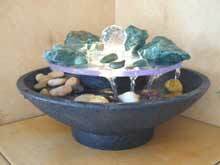 The fountains are approximately 300mm x 300mm square by 130mm high approx. 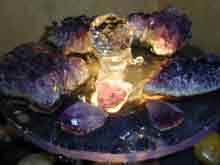 Crystal weight 1kg and overall weight 5.5kg approximately. 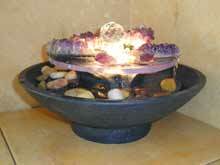 It is set on a slate bed, which has its own unique personality in shape and colours, the sides and bottom tray is also in slate. We handpick every crystal ourselves and use only the finest quality. We chose slate because this characteristic stone has no two pieces the same. They are formed by the action of heat and pressure acting over hundreds of millions of years on consolidated clays, which had been deposited under water. Their colours and undulating shapes are quite magnificent. You could not ask for a better combination of Fire, Water and Earth, neither one of the elements forming a destructive cycle and giving a perfect balance and harmony. 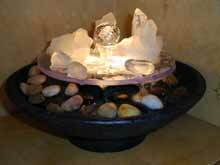 All fountains come complete with pumps, all you do is arrange your crystals and fill with water. £2.95 p&p UK, orders outside UK e-mail for rates rates@fengshuiweb.co.uk. 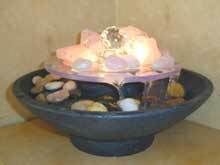 I personally select all the products we sell in our shop and although we have the most competitively priced Feng Shui items available, I can honestly say this is by far the best fountain and Feng Shui cure that we have ever sold. If you look in any shop or web site selling genuine crystals, you will see that not only is our crystal by far more superior it comes at an unbelievable price, mainly because we buy direct. For further details on purchasing please ring 01296 399100 or e-mail fountain@fengshuiweb.co.uk.